There will be one course for Agility run on Saturday 8th and one course for Jumping on Sunday 9th September 2018 at the Festival of Agility. These events will run directly after the Festival Club Challenge events during the lunch break on both days. The junior handler Novelty event is open to young agility handlers from the age of 7 to 17 (over 7 years old, and under 18 years on the date of the competition). Young handlers must run with the consent of a parent or guardian and be a financial member of Dogs NSW through a family membership, or under the full membership of their parent or guardian. This event is not a qualifying event. That is, there will be no qualifications earned by the handler for this event. 3) all participants have the ability to run a dog at the Excellent Level of both Jumping and Agility. Event will consist of 1 Agility and 1 Jumping course, all run at the Excellent level. All participants will have one run per course. ANKC Agility and Jumping rules effective 1st January 2018 will apply. 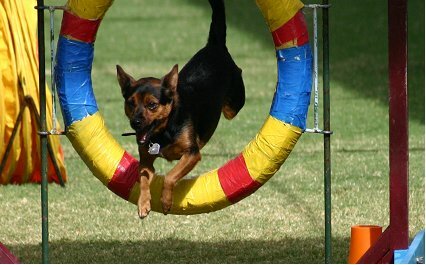 Entrants may run any dog that is capable of completing excellent level skill courses in Jumping and Agility. Handlers must run the same dog in both events. Coaches may walk the course with the entrant, give support and coaching when questions are asked. Coaches may not plot the course for the entrant or show them how to run or handle skills on the course. Places will be awarded to 1st 2nd and 3rd, per the ANKC Agility and Jumping rules effective 1st January 2018 (i.e. : as per the standard Agility and Jumping results as set out by the current rules, going on Time and Faults). In the case of a tie, the selection will be made with a Tie-breaker run off between the tied participants. Prizes: Sash and prize for 1st, 2nd, and 3rd in both Agility and Jumping. Make payment for your each entry via the tabs below. Submit the above via e-mail at nswagilitycommittee@gmail.com by Wednesday 5th September 2018, to be eligible to participate in this event.